Cannot combine specials. Not valid for holidays. Please mention special at the time of booking. (ONLY ONE DISCOUNT PER RESERVATION) YOU MUST MENTION THIS IN THE COMMENT SECTION ON YOUR RESERVATION IN ORDER FOR US TO APPLY THIS DISCOUNT TO YOUR RESERVATION. THANK YOU! Book any 2-bedroom cabin with a $99 deposit. 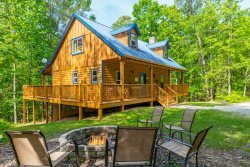 Book any 3-bedroom cabin or larger for just $200 down. Reservations must be made at least 30 days prior to your arrival. Are you flexible on your travel dates? Receive 20% off when you reserve weekday calendar gaps. Your arrival date must be the day of or day after a departure, and your departure date must be the day of or a day before the next arrival. Special is available over mid-season date ranges(excludes June & July). A 3-night minimum stay is required. Use Code BCCGAP at checkout to apply the promo or call us today at 706-865-1405 to check rates and availability. Unless otherwise stated, specials and discounts may only be applied to new reservations and are not valid during holiday dates* or peak time periods. May not be combined with any other special, discount, promotion, or group booking rate. Minimum length of stay required. Special must be requested at the time of booking or added during online check-out and will be confirmed by a representative within 1 business day. If the reservation is made within 30 days of arrival, please call 706.865.1405 to request a special, and the balance will need to be paid in full at that time. *Holiday dates are typically the weeks and days surrounding New Years, Easter, Memorial Day, Independence Day, Labor Day, Thanksgiving, and Christmas.